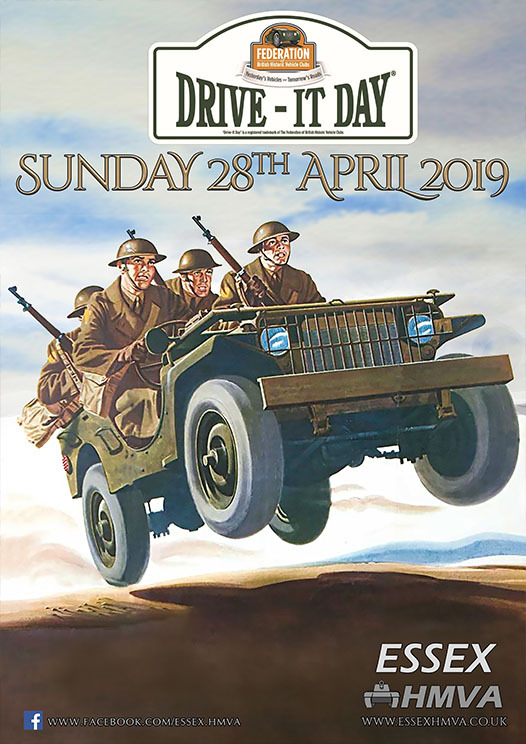 For the second year, the Essex HMVA will be taking part in the Federation of British Historic Vehicle Clubs drive it day on the 28th of April 2019, why not come along and cheer us on, en-route. This is a chance for military vehicle owners to take part in a road run in order to promote vehicle preservation. Q: Do you have to be a member of the Essex HMVA to take part? A: No, this event is open to non-members as well as our normal members. Q: Do you need a military vehicle to take part? A: This road run is for preserved military vehicles. We may allow certain period non-military vehicles such as fire engines etc, but please get in contact in advance. If you have a classic car, there are other events in the area which you could join. Q: This is called “Drive It Day” - can I drive a vehicle? A: Sorry , this isn’t a driving experience event for the public. It's called Drive It Day, as it's designed to encourage those who may not often drive their vehicle to get it out onto the road. Q: Do we stop anywhere ? A: Yes we will have 2 stops along the route, including a lunch stop in a local pub, where you may purchase a Sunday lunch. (One of the best in the area!). It gives you a chance to meet other vehicle owners and catch up with old friends. Q: Do you travel far? A: The overall route is around a route set in the Dengie Peninsular. It is less than 50 miles all round, and it is more about going at a steady pace, enjoying the countryside , rather than a road race. Last year, we had a convoy of around 30 vehicles. Please note: Essex HMVA Members who do not have vehicles should contact us if they would like to come along as a passenger in one of the vehicles taking part.